I have the same "problem" as WordPress, as in I need to allow batch changes of tags. The relationship is m to n; each element can have multiple tags. 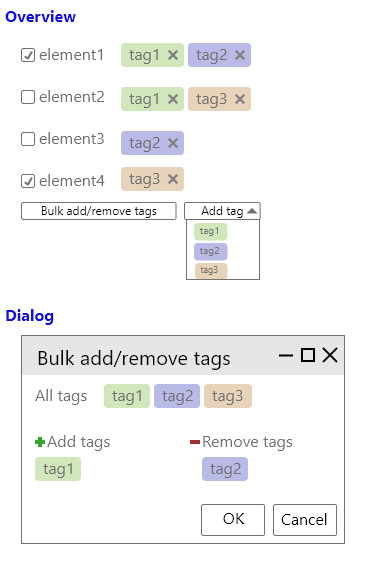 Now my main problem is that the elements might already have individual tags assigned, so selecting multiple elements for editing might result in having many "partially" matching tags. How to allow removing and assigning tags in one single go, as tags might be missing on some of the selected element, already be present on others? What happens when a tag should be removed that is not present on an element? What happens when a tag should be added that is already present on an element? For simple uses cases you could just ignore conflicts. But maybe your users want to be informed or abort the action completely if there are conflicts. Not the answer you're looking for? Browse other questions tagged usability interaction-design tags edit relationship or ask your own question. Showing single file download and multiple file download options?